Chief Minister K Chandrashekhar Rao addressing the TRS executive committee meeting at Telangana Bhavan in Hyderabad on Monday. Hyderabad: The Telangana Rashtra Samithi, which has set a target of winning 16 Lok Sabha seats, now aims to win all 32 Zilla Praja Parishads (ZPP) and more than 530 Mandal Praja Parishads (MPPs) in the State. 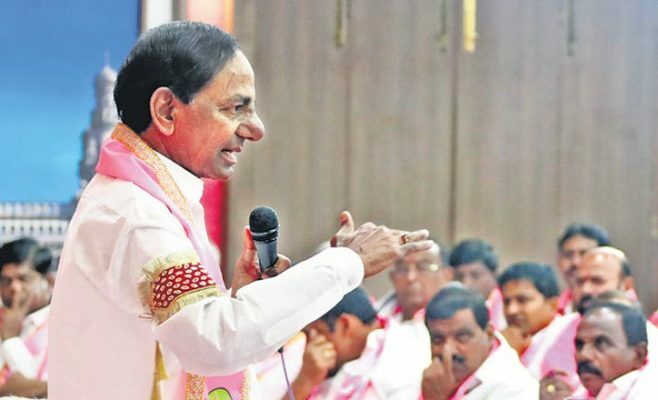 Chief Minister and TRS president K Chandrashekhar Rao directed the party leaders, including ministers and legislators, to work in complete coordination to ensure that the TRS wins a majority of ZPPs and MPPs in all the 32 districts. The Chief Minister appreciated the hard work of the party leaders during the recent Parliament elections and asked them to work harder to ensure that TRS wins all Zilla Parishads. He reiterated that TRS will play a decisive role in formation of the Central government after Lok Sabha election results are announced on May 23. He wanted the legislators to focus on village development using funds from the Centre and State governments as well as funds from local bodies. He also warned of stringent action against sarpanches who misuse funds. Chandrashekhar Rao is learnt to have predicted delimitation of the Assembly constituencies resulting in an additional 34 new constituencies. He reportedly assured several senior politicians who joined TRS in the recent past that they would be accommodated in these constituencies. He also said he would provide representation to Khammam district in the State Cabinet when the expansion takes place soon. Senior party leaders, Ministers, MLAs, MLCs, MP candidates, chairpersons of various corporations and other leaders participated in the meeting. Chief Minister K Chandrashekhar Rao on Monday said a special session of the State Legislature would be convened to pass the new Revenue and Municipal Bills once the draft legislations are ready. The Chief Minister is learnt to have made it clear that reforms were inevitable in governance through new Acts pertaining to Municipal, Revenue and Panchayat Raj for complete re-haul of the respective departments. He also discussed repercussions of abolishing the existing Municipal and Revenue Acts completely or partially. The legislators were asked to come up with their suggestions for bringing reforms in governance for effective delivery of government schemes. He did not want the entire government to be labelled as corrupt because of a handful of corrupt employees and assured that the new laws will protect sincere and hard working employees. Sources said the Chief Minister emphasised the need to curb corruption to bring visible change in governance. He asked the legislators and other party workers to create awareness among people on the need to enact new laws to end corruption. He also shared his experiences and explained that the Chief Minister’s Office was receiving several complaints on its fax number after his recent call to a Mancherial farmer on a land issue went viral on social media.